Restaurants are unique. They’re both PRODUCTION facilities and RETAIL facilities under one roof. The component parts (ingredients) of the product formula (recipe) are often perishable; restaurant employees are often empowered to experiment with new formulas for new products with little or no market research to assess demand; and finished products are often consumed by employees without paying for them. Culturally speaking, the cards are stacked against restaurant business profit. Toyota would never dream of letting their assembly line workers design a car but every day, restaurants leave their product offering to employees that do little more than wing it. Menu development and engineering is a balancing act that considers inventory usage, station load, item performance, assortment relationships, and market analysis. While it’s not financially practical to permanently hire the talent you need to develop menus and engineer product offerings, it’s also not practical to go to market with menus created by your line cooks and bartenders. 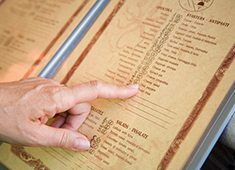 Hire us to engineer your menus to appeal to your market and to deliver profit. Once your staff is trained to execute your new menus, we’re off of your P&L until you need us again. That’s smart money.